Myles Kennedy missed out on the aborted 'Led Zeppelin' tour, but the Alter Bridge singer has just scored a pretty cool gig: Slash tapped him to be the singer to front the band for his upcoming solo tour. "I want to announce that Myles Kennedy is going to be fronting the band for the upcoming tour," Slash wrote on his MySpace blog. "Something I'm really stoked about. Myles sang a killer track on the record & I think he is by far one of the best Rock & Roll singers out there today. I'm really honored & proud to be working with him. I will announce the other band members shortly. "Lastly, we're starting to route the tour," he continued. "I want all my fans to follow me on Twitter & tell me what city/country they're from & to tell all their friends & family in that city/country, who are fans, to do the same. "I want to get a really good idea on where my fans are, even the obvious major cities & focus the tour around that. So if you're from Alaska or Zimbabwe or anywhere in between I want to hear from you. Follow me at Twitter.com/slash Hudson." Details of Slash's solo record have just been announced. In addition to Kennedy, an all-star roster of guest musicians are featured: Ian Astbury, Chris Cornell, Rocco DeLuca, Fergie, Dave Grohl, Kid Rock, Lemmy Kilmister, Adam Levine of Maroon 5, Duff McKagan, M Shadows of Avenged Sevenfold, Ozzy Osbourne, Iggy Pop and Andrew Stockdale of Wolfmother. 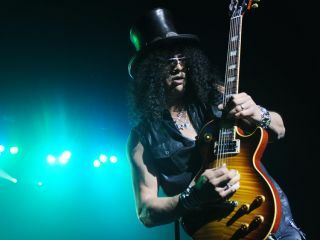 The album will be issued in an unusual and exciting manner: in advance of the standard release, a 'fan pack,' in which the Roadrunner Records album will be bundled together with a highly-collectable special issue of Future Publishing's Classic Rock magazine dedicated to Slash's career will be on newsstands soon. Click here for the track-by-track guide, in Slash's own words.